VISALIA– Kaweah Delta has put its heart in the right place, first place. 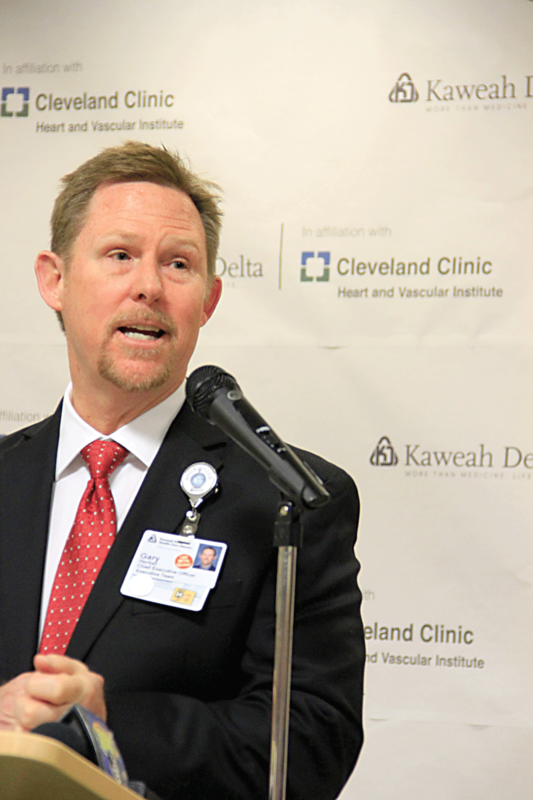 Kaweah Delta has joined forces with Cleveland Clinic’s Heart and Vascular Institute, the No. 1 ranked heart program in the U.S., in an effort to help further elevate services for people seeking cardiovascular care in the Central Valley. As an affiliate, the two organizations will stay independent and physicians and staff of Kaweah Delta’s heart program will remain the same. 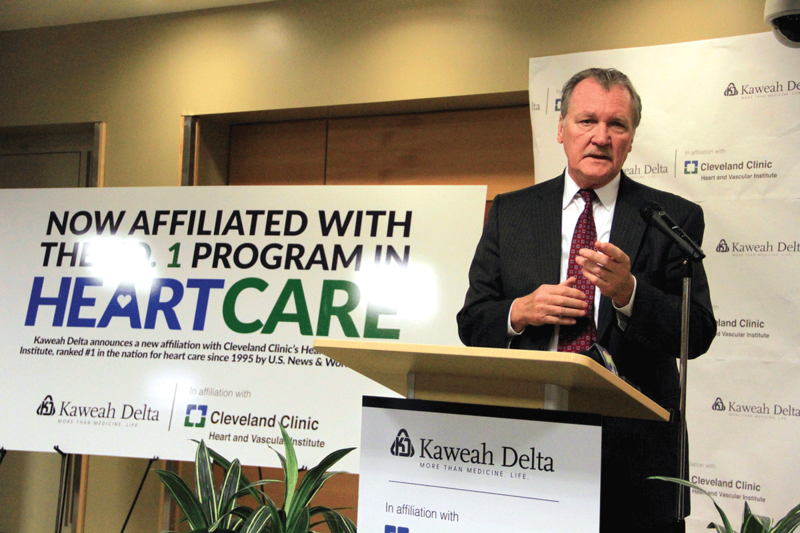 However, the affiliation will give Kaweah Delta access to best practices that have helped the Ohio-based Cleveland Clinic’s heart program achieve U.S. News & World Report’s No. 1 cardiology and heart surgery ranking since 1995. Kaweah Delta announced the affiliation at a Jan. 25 press conference in front of more than 100 people in the hospital’s Acequia Wing lobby. Kaweah Delta and Cleveland Clinic’s heart program will share best practices in patient care, outcomes measurement, quality reporting and clinical research. Physician teams from both entities will collaborate to accelerate advances in heart care treatments and protocols. Medical staff members of Kaweah Delta’s heart program were very supportive of the affiliation, said Harry Lively, M.D., Chief of Medical Staff at Kaweah Delta. In addition to better patient outcomes, Dr. Lively said the affiliation should mean shorter hospital stays and lower hospital bills for patients in need of heart-related procedures due to faster recovery times and being able to handle more of the complex heart cases that previously may have been sent out to another hospital. Located in Cleveland, Ohio, Cleveland Clinic employs 52,000 people including more than 3,600 full-time salaried physicians and researchers and 14,000 nurses, representing 140 medical specialties and subspecialties. Cleveland Clinic’s health system includes a 165-acre main campus near downtown Cleveland, 11 regional hospitals, more than 150 northern Ohio outpatient locations – including 18 full-service family health centers and three health and wellness centers. In 2017, there were 7.6 million outpatient visits, 229,000 hospital admissions and 207,000 surgical cases throughout Cleveland Clinic’s health system. Patients came for treatment from every state and 185 countries. For more information, visit clevelandclinic.org or follow them at @ClevelandClinic. News and resources available at newsroom.clevelandclinic.org. Jeffrey Rich, MD, chairman of operations and strategy at Cleveland Clinic’s Sydell and Arnold Miller Family Heart & Vascular Institute, said Kaweah Delta is only the 17th hospital nationwide to be selected for an affiliation. He said the affiliation will elevate care for patients in the Central Valley by sharing best practices, intellectual property, and educational and training resources and opportunities. Suma Thomas, MD, a cardiologist and Vice-Chairman of Operations and Strategy at Cleveland Clinic Heart and Vascular Institute, will work directly with Kaweah Delta’s medical staff to find common practices, identify the hospital’s strengths, and to search for opportunities to improve the quality of their health care, from how they conduct meetings to implementing the latest technology. “We want to work with the top hospitals with proven practices who also have the same dedication to health care that we have,” Dr. Thomas said. The formal affiliation will be beneficial in a variety of ways, said Regina Sawyer, D.N.P., Vice President and Chief Nursing Officer of Kaweah Delta. “It has truly been rewarding working with the Cleveland Clinic physicians and staff over the past three years. I look forward to renewed energy and to our continued partnership through formal affiliation,” Sawyer said. In keeping with its philosophy, Kaweah Delta announced a partnership with Sierra View Medical Center in Porterville in December. The separate public hospital boards approved a joint powers agreement which will allow both hospitals to lower the cost of ordering pharmaceuticals and the cost of efforts to recruit physicians to the area. It also left the door open for a jointly operated clinic and centralize some of their services. Herbst said then that partnerships between independent health care entities is becoming the norm. While the affiliation with Cleveland Clinic will have no effect on the JPA with Sierra View, Herbst did say the two Tulare County hospitals have already signed an agreement that could also improve cardiology in Porterville. The two hospitals have already signed another agreement for Kaweah Delta’s cardiology department to be on-call during heart-related procedures at Sierra View. In order for a hospital to perform angioplasty and stent procedures to unclog arteries, Herbst said the hospital must also provide open-heart surgery in case of complications during the procedures. Sierra View does not currently provide open-heart surgeries. Under the agreement, Herbst said Sierra View would be able to offer angioplasty and stent procedures because complications would be handled by Kaweah Delta heart surgeons. Herbst said if complications were to occur, the patient would be airlifted from Sierra View to Kaweah Delta where doctors would be on stand-by to perform open heart surgery. Herbst said the agreement has been signed but has not yet taken effect.